AfroDJMac presents Mode Density Free Ableton Live Pack, a free live pack made with samples from ModeAudio's Density Pack. Until October 12, UVI's library of contemporary instruments can be purchased for $75 instead of $149. The library UVI chose for its new weekly sale is PlugSound Pro, which benefits from a 50% discount all weekend long. XPand! 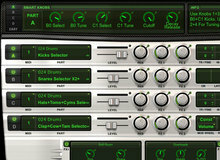 2, the virtual expander originally create by Digidesign then branded by Avid for Pro Tools, is now available at AIR Music Technology. Every weekend, UVI lowers the price of one of their bestsellers. This week, they chose the PlugSound Pro library. EastWest/Quantum Leap launches a week of spring offers with discounts on a selection of sound libraries, including the Complete Composers 2.